There’s a pop classic in Taiwan called “Grandma’s ­Penghu Bay.” The lyrics speak of the gentle even­ing breezes that waft over ­Penghu Bay, the white-capped breakers and sundrenched beaches, and of course the sea of blue, so blue. 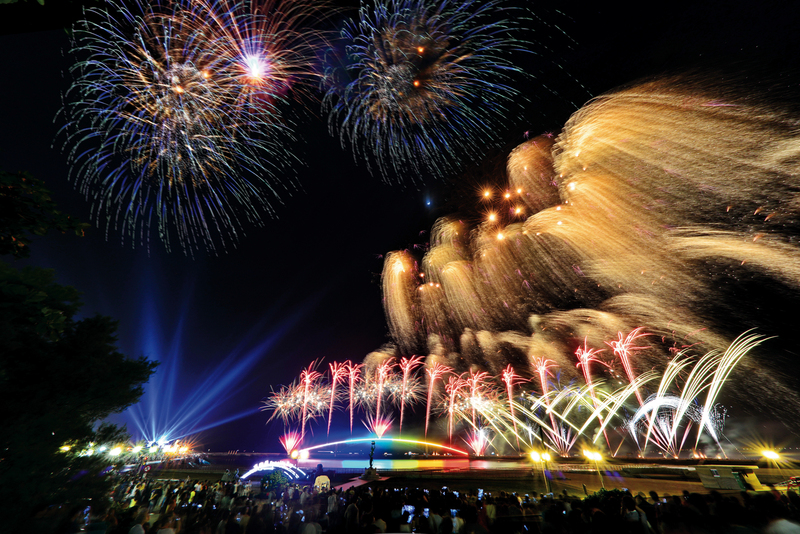 The ­Penghu Islands (also known as the Pescadores) attract tens of thousands of tourists annually, especially during the Ocean Fireworks Festival, and most can’t help but start singing “Grandma’s ­Penghu Bay” to themselves. It would be a shame if the beautiful scenery of ­Penghu were to be enjoyed only by the people of Taiwan, which is why in recent years ­Penghu has been actively promoting marine tourism for visitors from home and abroad. 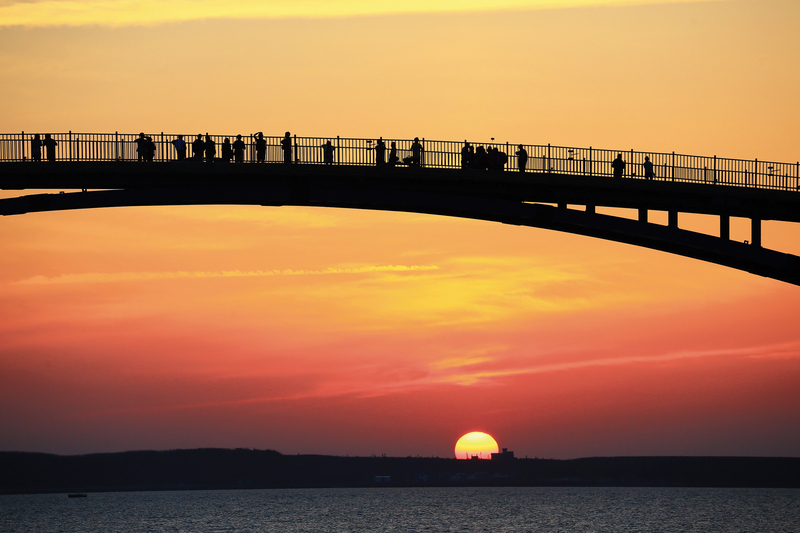 Not only has ­Penghu joined the “Most Beautiful Bays in the World Club,” it will be the venue for the club’s 2018 annual meeting, providing a fabulous opportunity for marketing itself to the world. There are six types of basalt formations in the world, and five of these occur in ­Penghu. Of the 99 islands and islets that make up the archipelago, all but one are composed of volcanic basalt. The one exception is Huayu, the easternmost, which is formed from andesite. Penghu’s basalt configurations originated when volcanic magma cooled at different times and under different conditions, producing variations that include columns, folds, and faults. For example, the Da­guoye Columnar Basalt—perhaps the most popular sight on the islands—comprises a series of hexagonal basalt towers, with sharply defined corners and edges. Then there’s ­Jingyu (Whale) Cave, located on Xiao­men Islet, where relentless erosion by the ocean has cut out a “sea arch.” Over on Yuan­bei Islet, meanwhile, the basalt appears as radiating columns, looking for all the world like a pleated skirt. 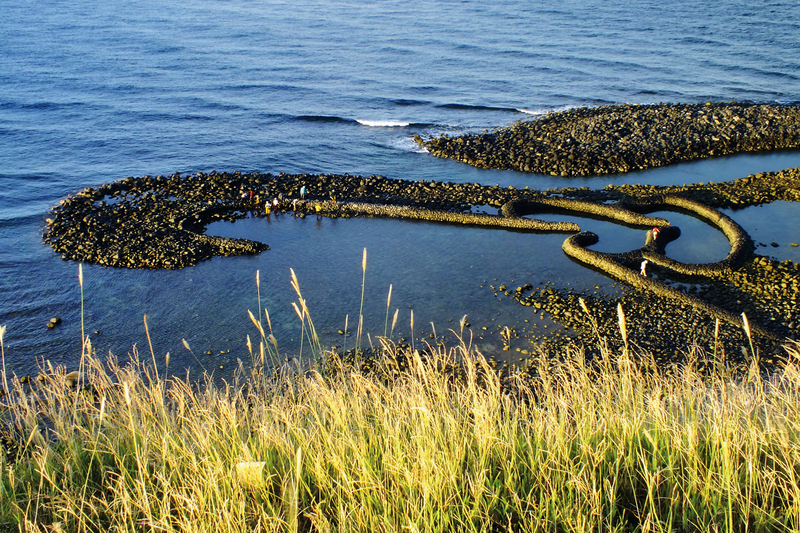 Besides the plethora of interesting basalt vistas, ­Penghu also boasts more than 500 stone “fish weirs”—tidal fish traps—scattered in the waters on the edges of the islands, revealing the ingenuity of ­Penghu’s early residents in catching fish. The most famous of these weirs is the “Twin-Heart Stone Fish Trap” in Qi­mei, so called because it looks like two intertwined hearts. Some visitors mistakenly assume that the twin hearts were constructed by the county government as part of its coastal works to improve the islands’ appeal for marine tourism, but in fact these weirs date back 300 years. Fishermen came up with the brilliant idea of using coral stone, basalt, or other materials to build round pond-like structures in shallow water that would flood at high tide and then, when the tide went out to below the level of the stone walls, trap fish inside them. But over time people stopped using this fishing method, and many of the weirs collapsed and disappeared. Given the traps’ wonderful scenic value, in recent years the county government has been investing in their preservation and renovation, for which they hired a team of local residents and craftsmen familiar with traditional weir-building techniques. The team has successfully preserved many of these beautiful structures, including the “Twin Hearts” and Ji­bei fish traps. Tongpan Islet, Er­kan Village, the “Moses Parting the Sea” sandbar at Kui­bi­shan… there are interesting sights everywhere you go in ­Penghu. To encourage travelers to explore more fully all that the islands have to offer, ­Penghu plans to promote more “island-hopping” tours. Chen ­Kuang-fu explains that each of ­Penghu’s 99 isles has its own unique features, so there is great potential for island-hopping itineraries. As part of this effort, this year for the first time the “Ocean Fireworks Festival” will expand beyond the county seat of Ma­gong, with events being held in all five other townships, including Qi­mei and ­Wang’an. Besides continuing to expand land-based tourism, ­Penghu also plans to develop recreational boating. ­Penghu has 68 harbors (mostly fishing harbors but also a few military ones) that have been largely left idle by the depletion of coastal fish stocks and the lack of young people who want to work in fishing. Taking advantage of ­Penghu Bay’s terrific scenery, the county government has decided to transform some of these idle harbors into facilities for pleasure boating. In June of this year, ­Penghu’s first yacht marina will open in Ma­gong City, with berths planned for up to 55 craft. In the future similar facilities will be opened in Qi­mei, ­Wang’an, Xiyu, and Bai­sha. People who sail to ­Penghu will have a variety of options of scenic offshore islands where they can dock. At the end of June there will be an event entitled “2017 ­Penghu Yachting Life,” which will serve as the formal ribbon-cutting for recreational boating in ­Penghu, and plans are in the works for next year’s Taiwan International Boat Show to be held here. Chen ­Kuang-fu relates that when the boat expo was held in Kao­­hsiung last year, it generated business worth NT$4 billion in just four days. He has expectations that the results will be similar when the venue is shifted to ­Penghu. These events will not only promote development of pleasure boating in ­Penghu, they will serve as warm-ups for the annual meeting of the “Most Beautiful Bays in the World Club,” to be held in October of 2018. Penghu launched its bid to join the MBBWC in 2010, and after two years of dedicated effort, succeeded in entering the organization. Membership has allowed representatives from ­Penghu to meet regularly with experts from other countries to exchange views on managing the marine environment and preserving seaside cultural assets. In early 2016, at the annual MBBWC meeting in the Philippines, ­Penghu beat out Barcelona to win the right to host the 2018 annual meeting. Chen ­Kuang-fu finds this extremely encouraging not only for ­Penghu, but for Taiwan as a whole. “Our biggest strong points were ecological conservation and natural scenery,” explains Chen. Despite the archipelago’s unique marine panoramas, ­Penghu has had few opportunities to advertise itself to the world. The 2018 MBBWC meeting will be a prime occasion for ­Penghu—and indeed for all of Taiwan—to strut its stuff on an international stage. In addition to the activities related to pleasure boating, the events that will serve as preludes to the MBBWC meeting will also include an international food festival. Chefs from around the world will be invited to utilize down-home signature ­Penghu ingredients such as cobbler’s tack (Glossocardia bidens), a medicinal herb, and the cobia fish (Rachycentron canadum) to produce dishes that have that authentic “­Penghu zing.” On top of all that, concurrently with the MBBWC conclave, Kao­­hsiung will host a meeting of the Global Harbor Cities Forum, inviting scholars from many lands to discuss issues of importance to port cities. Penghu’s cultural and historical attractions are no less delightful than its natural ones. For many tourists, the best place in the whole county is the “Seven Streets” area that extends out around Zhong­yang Street in Ma­gong City. Chen ­Kuang-fu notes that ­Penghu not only predates Taiwan proper geologically, but its history also boasts a number of “firsts.” For example, not many people know that before the Dutch built Fort Zeelandia in Tai­nan, they landed in ­Penghu and built a fortress at Feng­gui­wei in Ma­gong. In 1624 the Ming Dynasty responded by sending forces to dislodge the Dutch, who reached a negotiated settlement to withdraw to Taiwan. They dismantled their fort at Feng­gui­wei and shipped a great deal of the basalt to An­ping in Tai­nan to be used in the construction of Fort Zeelandia. This explains how colonial walls in Tai­nan came to be built of ­Penghu basalt! Another spot rich in historical significance is Ma­gong’s Jin­gui­tou Fortress Cultural Park, which opened in April 2017. Constructed in 1864, this former artillery emplacement was designated a national monument in 2011, and years of meticulous renovation work were completed in January 2017. It now is one of ­Penghu’s major historic sites. For the future, plans are in the works to link together Jin­gui­tou and nearby sites of interest, including Guan­yin­ting Recreation Area, Du­xing Tenth Village, Tian­hou Temple, Ma­gong Port, and several local fishing harbors. The sun, sea, sand, and style of ­Penghu attract many travelers from home and abroad, with total visits topping 1 million last year. At peak season, it is hard to even buy an air ticket. But this year there is a new option for getting to and from ­Penghu. Following the opening of a ferry-boat service from Bu­dai in ­Chiayi County to Ma­gong, a ferry line from Long­men in ­Penghu back to ­Chiayi went into operation in April of this year. Chen ­Kuang-fu points out that no one had expected Penghu‡­Chiayi round-trip services to be up and running for three or four years yet, so having them now is like a miracle! A one-way journey takes less than an hour, and there are seven sailings a day, with capacity of up to 300 passengers per journey. This should take some of the pressure off existing transport capacity. It should be added that ­Penghu is more than just about tourism, and is working to develop other industries as well. Since 2011 ­Penghu has been cultivating the green energy industry, with the ultimate goal of becoming a low-carbon county. Magistrate Chen tells us that the winds are very strong during the winter monsoon season, making ­Penghu ideal for developing wind power, with generators able to run at full capacity for 3800 hours per year. There is also plenty of sunshine for solar power, and the future possibility to use the tides to generate wattage. The county government has also been stepping up efforts to promote local fisheries and agriculture by creating ­Penghu brand names to differentiate their most outstanding products in the market. Chen says that they also intend to set up a traceability system to let consumers track the source of their purchases all the way back to the producers in ­Penghu, assuring quality and authenticity. “If you come to ­Penghu you’ll find great seafood and so many scenic spots that it’s impossible to name them all. In fact, one visit isn’t enough—­­Penghu is worth visiting again and again!” Chen ­Kuang-fu strikes his chest as he speaks, signalling his assurance that you will feel the same way.